Fine art, Illustration, graphic design and the art philanthropy of Sam Morrison: Garfield and Me? Here's a little something I found recently. 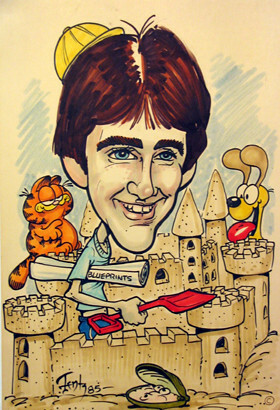 This caricature of me, done in 1985, was actually done by the guy who draws the Garfield comic strips. No, not Jim Davis, but Mike Fentz. (From what I gather Jim Davis does the stories and his hired hand of many decades does the illustrations). What was kind of cool was, I recently saw a special on Animal Planet about ficticious animals and Garfield was profiled. During the special Mike Fentz had numerous sound bites explaining how Garfield has artistically evolved over the years. I'd never met Mike Fentz, so I had no idea what he looked like until that show. (Reason being, the caricature was a gift from a family friend who was close friends with Mike). I have to admit absolutely HATING this caricature when I got it. I was 14 years old and very self concious. That caricature couldn't have been a worse gift to get at that age. (Truthfully, I don't think I'd even like to get one done of me now). That being said, the caricature has actually grown on me. I like that it was done in 1985 when garfield's popularity was pretty high. Plus it was done by Mike Fentz who's definitely part of Garfield's lenghty history.